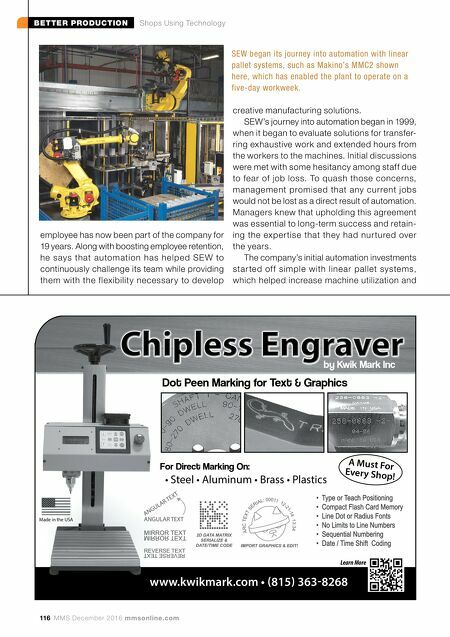 BETTER PRODUCTION Shops Using Technology mmsonline.com December 2016 MMS 117 enabled the company to familiarize itself with the methods and processes of automation. However, these systems did not fully address issues of operator ergonomics. Several years later, SEW invested in its first fully automated robot-tended system from a reputable machine supplier that used a third-party integrator. "The overall experience of working with robotics was very positive and substantiated our team's belief that this was the right direction to go; however, it also raised concerns about our selection of suppliers," Mr. Chandler says. "Not only did cell installation take more than twice as long as the supplier initially quoted, but almost every issue that arose during the process resulted in arguments between the two companies. We came away from the experience with some degree of confidence in the technology, but not in the people or the suppliers we worked with." Despite installation issues, the value of the robotic system was clear in its improvements to both efficiency and operator wellness, SEW says. In 2006, the company decided to expand its robotic system, but it was again confronted with the challenge of identifying a supplier for equip- ment and integration. 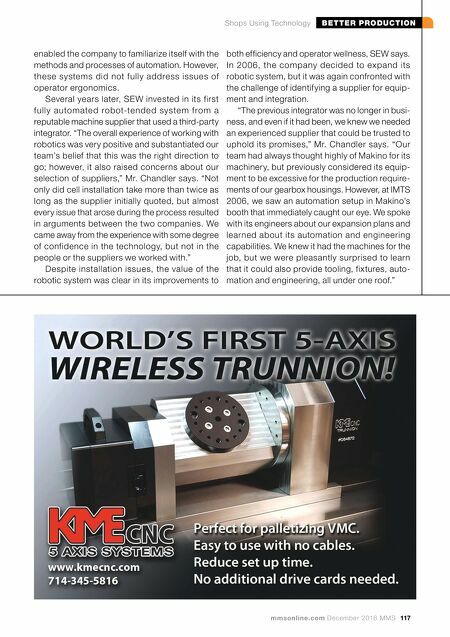 "The previous integrator was no longer in busi- ness, and even if it had been, we knew we needed an experienced supplier that could be trusted to uphold its promises," Mr. Chandler says. "Our team had always thought highly of Makino for its machinery, but previously considered its equip- ment to be excessive for the production require- ments of our gearbox housings. However, at IMTS 2006, we saw an automation setup in Makino's booth that immediately caught our eye. We spoke with its engineers about our expansion plans and learned about its automation and engineering capabilities. We knew it had the machines for the job, but we were pleasantly surprised to learn that it could also provide tooling, fixtures, auto- mation and engineering, all under one roof."